Sun., July 8, 2018, 7:58 a.m.
A GRIP ON SPORTS • College basketball scheduling isn’t easy. There is so many competing interests to balance it’s at times like a game of Catan with a piece missing. And it’s getting tougher. Read on. • Each Selection Sunday the chairman of the NCAA’s committee goes on TV and explains the criteria his group used to make almost everyone in the country angry. And every year, the reasons vary at least a little bit – as does the nomenclature. For some schools, the committee’s convoluted reasoning behind filling the final at-large berth with Wossamatta U instead of Harrison University is what matters. For others, including Gonzaga, the key is seeding. Why was Kentucky awarded a third seed over Purdue or Duke a top seed over Arizona? That’s what Mark Few focuses upon. And then he schedules accordingly the next year. It’s a bit like shooting carnival ducks. The target moves slowly, but it’s moving nonetheless. However, Few knows the West Coast Conference schedule, no matter how well Saint Mary’s and BYU are playing, isn’t going to impress a committee member who just watched the ACC or Big Ten regular season up close. So the nonconference matchups mean even more for the Zags. The committee’s preferences have to be the taken into account. But it still isn’t easy to get high-profile opponents to come to Spokane, though it’s not the impossible task it was a decade ago. And the home fans, who felt slighted by last year’s McCarthey schedule that was featured such “powers” as Texas Southern, Howard and Incarnate Word, need to be placated. The upcoming schedule, which still has one open spot, reflects all of that. The WCC’s poor national reputation? Gonzaga pushed for two less conference games, got its wish and is using the dates for nationally ranked opponents. 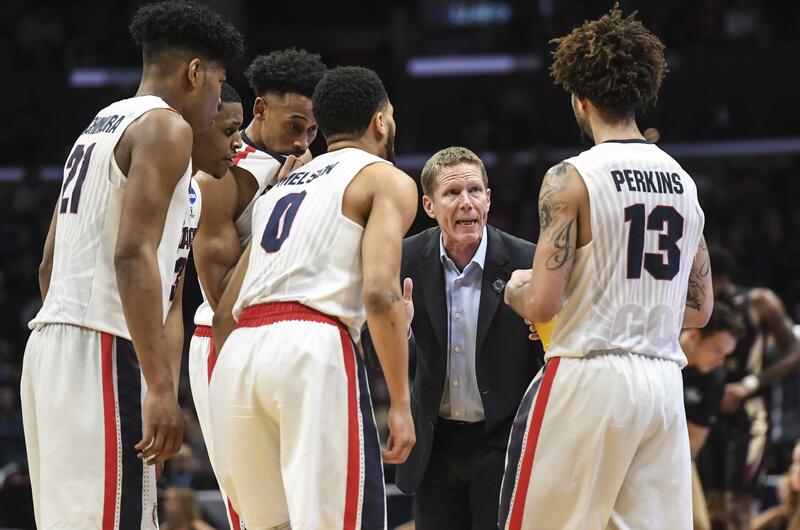 Which is a good thing as Saint Mary’s, the one other conference schools that has made a dent in national rankings recently, looks to be facing a down year. The McCarthey slate? Texas A&M and Washington will be in the Kennel this season and both are what can be considered marquee matchups. And the bottom end of the nonconference home slate isn’t as low as it’s been, with Denver, Cal State Bakersfield and North Dakota State all offering more of a challenge than, say, Howard. The high end of the nonconference schedule? As Jim Meehan explains in his typically in-depth story today, it’s about as good as Gonzaga has ever faced. Don’t believe Jim? How about a game with North Carolina in Chapel Hill? Or Tennessee in Arizona? Creighton in Omaha? The Maui Invitational, which also includes Duke, Auburn, Xavier and Arizona? Jim rates it as the third-best the Zags have ever scheduled and that’s before the Maui matchups have been announced. It could get better. So why are the Bulldogs playing such a killer nonconference slate? It’s simple. The reward outweighs the risk. By a lot. Unless something – actually, a whole bunch of somethings – untoward happens, the Zags will be in the NCAA tournament for the 483rd consecutive year. But that’s not the goal. Another trip to the Final Four is the true pot of gold. Seeding plays a huge role in that. It looks, in mid-July at least, as if the title will be up for grabs again. Kentucky and Kansas are the favorites, but neither seems to be a can’t-be-beat super team. Any one of a handful of other schools, Gonzaga included, is in the running. The WCC schedule isn’t going to miraculously improve next year, though there is some hope the conference’s middle is improving – and that the bottom end will get better in the future. Still, from January to March, the Zags will be heavy favorites in just about every contest. Before then, though, they need to sharpen their game, to build equity with the committee in case of a late stumble and to experience a big-game atmosphere similar to what they will see in the tournament. The upcoming nonconference schedule does all that. And maybe a little more. Gonzaga: As we said, Jim has a story on the nonconference slate. WSU: Tyler Hilinski’s younger brother, Ryan, is preparing for his senior year of high school. He has more to play for these days. … Around the Pac-12, Oregon State won the most recent of the many national titles the conference won in 2018. But the Beavers’ championship, their third this century, may have been the most remarkable, considering what they went through in Omaha. … Utah’s new athletic director is getting the lay of the land. … Reid Travis has his Stanford degree. Now he’s trying to ensure an NBA spot. … A former UCLA basketball player, Tyler Honeycutt, was found dead after a confrontation with police at his home. Idaho: The Vandals’ 2018 Hall of Fame class features a lot of names you probably recognize. Shadow: A late first-half goal ended up knocking the Shadow out of the playoffs. Golf: The wind has been blowing around here lately, and it’s having an impact on our sporting events. Jim Meehan was at the Fairways yesterday for the third round of the Lilac City Invitational and watched as the wind affected the scores. Indians: Spokane has yet to win a road game this year. The latest loss came last night 7-3 in Canada. … Around the Northwest League, Eugene and Everett both lost again. Mariners: James Paxton was sailing along against the visiting Colorado Rockies on Saturday night. Then he made one mistake. It left the ballpark and the Rockies ended up winning 5-1. … Robinson Cano met with the media before the game yesterday and talked about his immediate past and future. … In his Out of Right Field column, Gene Warnick examines Cano’s press conference. … Seattle made a roster move yesterday. Sounders: They didn’t get the win they really needed, but the Sounders did pick up a point with a scoreless draw in New England. … Portland won 2-1 over visiting San Jose. Published: July 8, 2018, 7:58 a.m.